The wizards Furb of Fun, Feiz of Power, and Fern of Nature are back in the land of Tibia, competing for the votes of the Tibian citizens. 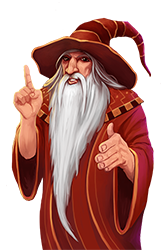 You can now decide again who is the most popular wizard among them in your game world. Starting with today's server save, various monsters will drop envelopes with red, blue, or yellow powder. If you want to know how to colour yourself and mix colours, check the letter that is included in the envelopes. If you are interested in further facts about the event, please check with the wizards' loyal fans: Friedolin, the fan of the orange wizard awaits you in Carlin. Paulette supports the violet wizard and can be found in Thais. Representing the green wizard, Nathaniel stands in Venore. 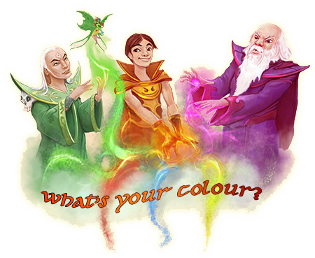 During the competition, you will receive bonus points, which you can trade with these three supporters of the wizards after you have chosen your colour. Use the bonus points to get your own chess box if you did not possess one yet. If you have one already, you can complete your set of Zaoan chess figurines made of jade and obsidian. Furb of Fun: The shared experience bonus in party mode will be raised by 30%. The chance to successfully sculpt from ice cubes and marble will be multiplied by 10. Also, fireworks rockets, party trumpets, snowballs and party hats can be found in all the creatures which dropped envelopes. Feiz of Power: The majority of spellcaster creatures such as ice witches or draken spellweavers, for example, will give 25% more experience points. 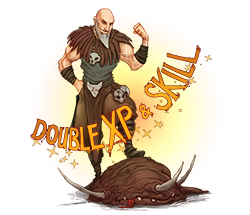 In addition, the skill bonus of berserk and bullseye potions will be raised to +7, and the shielding decrease will be set to -8 instead of -10. The magic level bonus of mastermind potions will be raised to +5. Fern of Nature: All health and mana potions will be enhanced by 10%. Are you ready for the first Double XP and Skill Weekend in 2019? Gain twice the amount of experience while hunting your favourite monsters and teach them the true meaning of fear. In case you still have some power left afterwards, you should spend some time at your exercise dummy and push your skills to the next level. Between the server saves of March 08 and March 11, all monsters will yield twice the usual amount of experience points, and your skill training, including magic level, will advance twice as fast. The skill progress when training offline will also be doubled. 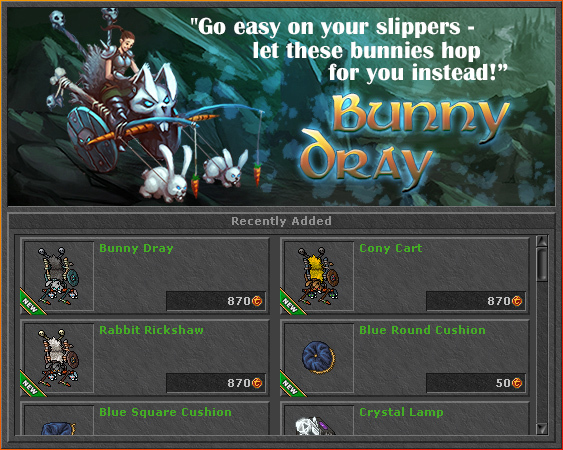 As of today's server save, you can purchase the newest furnishings coming straight from Kazordoon's best stonemasons. Polished with a secret tincture, the processed stone comes with a unique structure and colour and represent a bridge between both modern and rustic lifestyles. Being resistant against weathering and frost, the Dwarven Stone Furniture qualifies as garden furniture as well. In case that just thinking about the cold and hard stone makes your back hurt already, we have a more comfortable alternative for you. Get yourself a soft and fluffy cushion! There is a round and an angular shaped version of each colour. Choose your favourite ones and decorate your house with those warm and cosy pillows. Trophy collectors should take a look at the brand new skulls that are now available. Both the Minotaur Skull and the Demon Skull can be purchased with a golden colouring or a grey one. The Minotaur Skullmight also looks good on your wall. The new crystal and idol lamps can be used to expand the lightning in your house and to set the right mood for your new decoration items. Enjoy the new deco items! Attention, attention! 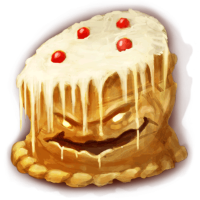 Starting on Thursday, February 21, cake golems will return as part of the "A Piece of Cake" event and attack certain cities in Tibia. Gather all pie lovers and face those sweet temptations. Those who manage to eat the huge amount of cake can look forward to yummy rewards! Slay the invaders to get enough sweet and sugary substances and lure them into the cake extractor machines in Thais, Liberty Bay, Carlin, Darashia, and Edron! Both actions are necessary to enable the bakers near the machines to build a bridge to the legendary cake island. Once you are on the island, you need to start munching the giant cake - as fast as you can. There is no bite to waste! Time will run out with the server save on February 26. If you manage to polish off the entire cake in time, your game world will be rewarded with 25% more health and mana regeneration and exclusively for premium accounts an experience bonus of 50% for seven days. The completely fills up your mana. The will refill your health. The will increase your distance fighting skill by +10 for one hour. Between the server saves of March 01 and April 01, all daily rewards will be doubled! All Tibians will receive twice as many items from the reward shrine during that time. The daily reward XP boost will last twice as long as well! The price of the Store service Temple Teleport was reduced from 55 Tibia Coins to 15 Tibia Coins. The Frame Rate Limit slider has been reactivated for windows clients. Navigation arrows to scroll through chat tabs are now displayed again. When copying a hotkey preset, the corresponding action bars are now copied as well. The initial sorting of Bestiary entries has been restored. An issue, which occasionally reset the colours of hireling outfits, has been resolved. Resting bonus zones were added to the temple of Rathleton again.